The sides had until July 15 to work out a long-term contract after the club used the franchise tag on its best pass rusher again. A year ago, Lawrence signed the $17.1 million offer right away. This time he didn’t, and had been putting off shoulder surgery while negotiations dragged. The talks heated up quickly this week, not long after executive vice president of personnel Stephen Jones said at the NFL owners meetings that Lawrence and his representatives were at an impasse. They didn’t get close to a long-term deal last year. The total value of the contract trails only Chicago’s Khalil Mack ($141 million) and Von Miller of Denver ($114 million) among edge rushers. Both are three-time All-Pros. While Lawrence has been to the past two Pro Bowls, he’s still looking for his first All-Pro nod. 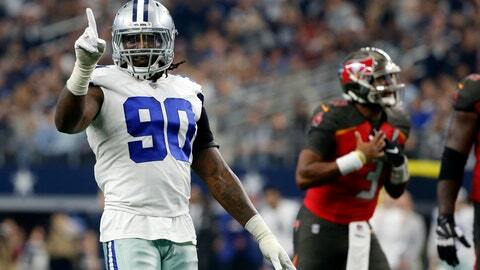 Lawrence earned $17.1 million under the tag last season after finishing tied for second in the NFL with 14½ sacks in 2017. He had another double-digit season with 10½ last year, and is considered one of the better run defenders among pass rushers. The former Boise State player’s career started slowly, with eight of the nine sacks from his first three seasons coming in his second year. He battled injuries early in his career, and was suspended four games to start the 2016 season for violating the NFL policy on performance enhancers. The healthiest season of Lawrence’s career was his best, when he had 10½ sacks in the first seven games. He has 34 sacks in 64 games in his career.